Ananka's Diary: Just What I Needed! The only interesting thing I could find on the news was some guy who had a library book checked out for seventy years... Now, you know that there's nothing going on when THAT story makes TV. Im working on a travel project and I decided not visit the usual places: England, Japan, France, Hawaii, etc. And I found http://weirdplacestovisit.com/ Four words: Screaming Tunnel, Niagara Falls. You welcome!!!! The antartica one probably wasn't the greatest though!!!! Top Gear alwAYs brightens my day!!! If you get BBC America then it's every Monday at 8 pm! Also girl with her head in the star. They use a needle to inject the jelly in the jelly doughnut!!!! I have had a doughnut that was cooked in two parts then the bottom half was filled with jelly, then the top half was put on. Ugh, today in math I sat there for what seemed like FOREVER! It was even worse then a Monday!! Oh, and you guys, I know that I posted this on yesterday's comments, but I'm starting a group of Irregulars in WA and if you guys have any tips then let me know! great like we need more cockroaches gross :/ and ppl who are having bad tuesdays i know how you feel i fell asleep twice during class today from boredom and tiredness!! that scene seems strangely familiar... Oh, wait, that's been me way 2 many times. 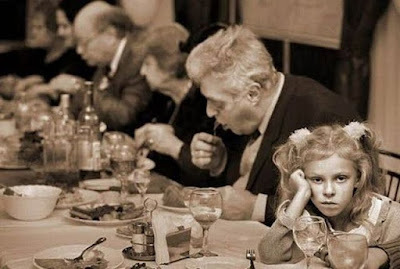 Nothing is worse than a long dinner full of grownups and inedible food. Especially when they make u wear a DRESS!!! eeeeeeekkkkkkkkkkkk!!!!!!!!!!!!!!!!!!! of course now we all want to read kiki's post! A dead octopus? I mean, really, how would you get in that situation? Yeah, I'm still in New York. It's pretty cool actually. You can buy all sorts of stuff here. Yeah, I got it. Took me forever, though. Don't worry, I'm on my way to the airport as we speak. So, get the lab set up because I want a sample from this octopus as soon as... Oh crud! I left it on the subway! I had an Awful day today! Thanks for letting me laugh in amusement and confusion!